Cultural Shaping of Violence proposes that violence cannot be described, let alone understond or addressed, unless tied to the cultural settings that influence it. The book's 27 chapters, researched and written by 28 scholars of seven nationalities, document violence in 22 distinct cultural settings in 17 nation-states on five continents. Internal to each society, a number of sites of violence may thrive, from the domestic sphere to social institutions and political arenas. In whatever site or guise, violence reverberates throughout the social fabric and beyond. 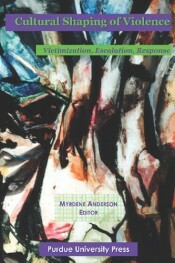 Myrdene Anderson is an associate professor at Purdue University . She is an anthropologist, linguist and semiotician. For a citizen-scientist immersed in many cultural worlds, Anderson considers violence an imperative intellectual and pragmatic issue. However, this book was a collaborative issue. A majority of the authors are anthropologists.